Explore North Coast (ENC) and Humboldt State University (HSU) are working together to get more people on the water, safely. The partnership draws from the strength of both organizations. ENC members are skilled paddlers who can provide kayaking instruction and guide group tours. 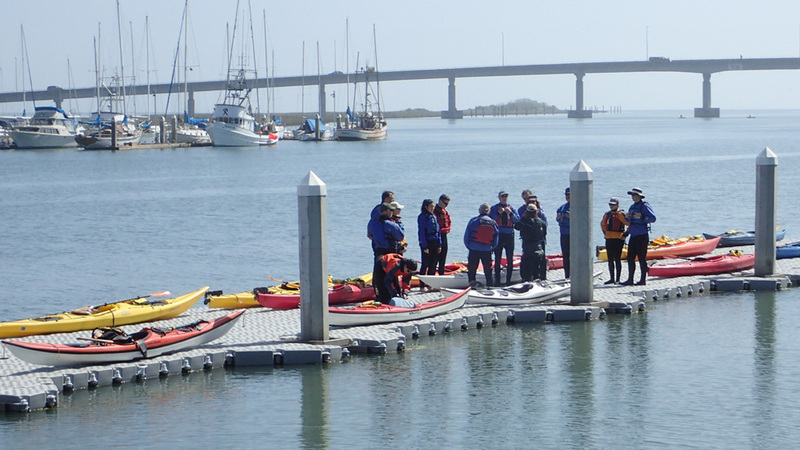 The Humboldt Bay Aquatic Center (HBAC), administered by HSU, is a beautiful facility on Humboldt Bay that maintains quality equipment for kayaking, stand up paddle boards, sailing and canoeing. The partnership with HBAC started in Fall 2014. Through HBAC’s Aquatic Adventures Program, ENC members provide basic kayak instruction and lead guided tours. The partnership provides opportunities for new paddlers to begin exploring local waters safely and at minimal cost. The program appears to be a hit with all age groups, and participants are finding the program fun and affordable. Where else can you be outfitted with all the kayaking gear and be given a two to three hour tour and/or instruction for $40 (HSU student) or $50 (all others)? More people on the water will also increase opportunities for local businesses who provide intermediate and advanced kayaking instruction and sell kayaking gear. The new partnership provides tremendous opportunity for families and friends to experience this incredibly fun sport. HBAC’s offerings can be found at the Center Activities Aquatic Adventure Program website, and the Aquatic Center can be followed on Facebook. Contact Mike Zeppegno for more information or to join this effort.